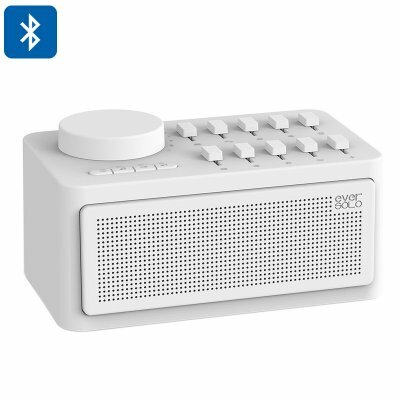 Successfully Added Zidoo White Noise Generator - Sleep Therapy, Bluetooth Support, Ten Sound Effects, AUX Input, Three Timer Modes to your Shopping Cart. With the Zidoo white noise generator, you’ll be able to increase the quality of your sleep and wake up well-rested the next morning. This sleep aid produces a stream of white noise that is created by a continuum of frequencies that have been distributed equally over your entire hearing system. Thanks to this, it provides a soothing and calming feeling that blocks out background noise, makes you calm, and helps you sleep. White noise has proven to be a great sleeping aid for those of you that find it difficult to fall asleep and for people that often wake up during the night. This smart home accessory treats you to high-end sleep therapy in your own bedroom. Simply plug it in, and you’ll be able to enjoy a good night of rest like you have never experienced before. This white noise generator also supports Bluetooth connectivity. Thanks to this, you’ll be able to synchronize it with any Bluetooth enabled device to listen to music. With this cool electronic gadget at your night table, you’ll be able to listen to your favorite tracks whenever you’re lying in bed. By supporting an AUX input, it even lets you hook up this speaker to other audio devices. When used as a sleeping aid, this cools gizmo produces a steady stream of white noise without any clip looping or interruptions. Thanks to this continuous sound, you won’t get distracted and will be able to easily fall into a deep long sleep. By adjusting the audio timer to your personal needs, you can be assured that this sleeping aid will always keep on playing until you’ve managed to fall asleep. It supports a wide range of different sound effects to meet your personal needs. Whether you enjoy the sound of nature, fire, or whistling birds – this sleeping aid supports it all. With this amazing sleeping gadget, everybody will be able to enjoy a great sleep and wake up fresh the next morning. This white noise generator comes with a 12 months warranty, brought to you by the leader in electronic devices as well as wholesale electronic gadgets..